To “upcycle” something is to reuse it in such a way that makes it more valuable to you than it was before. 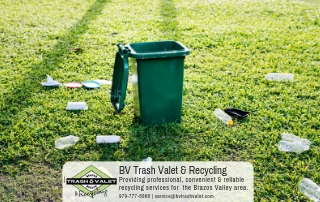 If something is about to go into the trash, just about anything would be more valuable than it is to you at that moment. Upcycling your old junk is a great way to save money and to be more environmentally conscious. 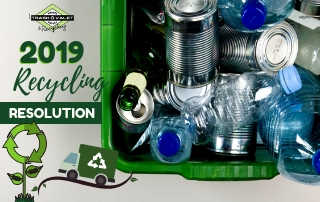 Recycling is always preferable to just throwing things in the garbage, but if you can reuse your old items first, that’s the ideal. Here are some ways that you can reuse before you have to finally send something off to the recycling bin. Does your mother keep a plastic bag in your home that’s full to the brim of other plastic bags? This is an old household trick for making sure disposable grocery bags don’t go to waste. 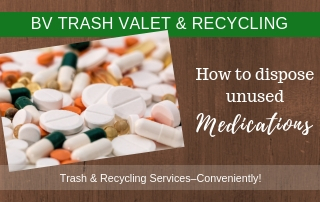 You can use and reuse them until they’re worn down to shreds if you hold onto them, and there are always uses around the home to have a plastic bag. That same principle can apply to almost any container you use: an old butter or whipped cream bowl can be used to store leftovers. Old wine bottles can become dish soap dispensers or candle holders. Any time you finish a container, just wash it and reuse it until it can’t possibly be used anymore. Some of the best artwork can be compiled of old junk you don’t need anymore. Wine corks, for instance, can be turned into beautiful artwork to adorn your walls. Extra buttons and coffee tins can become creative artistic utensils, too. You can even use your old junk as bookends. Or you could use an old pickle jar to create a terrarium. 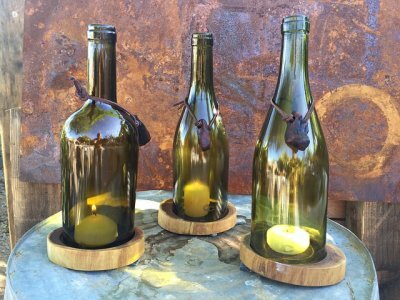 Reusing those no-longer-functional items to decorate your home is a great way to add character and a sense of self-expression to your home. Struggling to throw out a shirt or skirt that no longer fits? Maybe you can still get some use out of your favorite outfit, even if it’s not what it once was. You can use the material to create a headband or a book bag. Maybe you can even make a bracelet out of your old t-shirt to remember how well it served you when it still fit. There are plenty of creative ideas for repurposing (and re-wearing) old clothes. On the other hand, maybe you can take the fabric from old curtains or sheets and create a new dress or shirt. Get the most out of your belongings for as long as you can. You might be surprised how long they can last you, and in how many different ways. 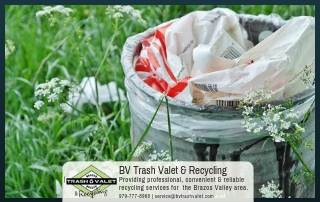 When you are ready to recycle, though, consider BV Trash Valet. 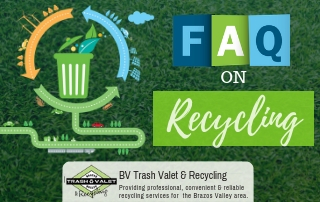 They provide curbside recycling and garbage pickup for residents in Brazos Valley but outside of Bryan-College Station limits. There’s no sorting required, and they accept more plastics than any of their competitors. Check out their list of acceptable materials here and then give them a call.